mmsonline.com January 2017 MMS 81 FEATURE features needed to ef fectively process these rotors, and size is one. The M-80 with tailstock can swing 39-inch-diameter workpieces with the steady rests removed and accommodate material as long as 236 inches between centers. It also features a 100-horsepower main spindle and an 80-horsepower B-axis milling spindle offering 220 degrees (±110 degrees) rotation. Mr. Lassan- dro says every one of the automatic toolchanger's 72 stations is used for a range of tools that have a Capto C8 tool interface. The M-80's slant-bed design is important, too, to provide easy operator access to the work area during setups. Due to the length of these rotors, program- mable steady rests from SMW Autoblok are used to provide additional support. Three steady rests were purchased with the machine (two large and one smaller), although only two are installed on it at any given time. During fluting, the steady rests clamp on diameters on either end of the shaft to provide additional rigidity, minimize vibration during machining and prevent workpiece sag. Mr. L assandro says the complexit y of the machine presented him with a programming learning curve. This he overcame in part through training at WFL's Linz headquarters. 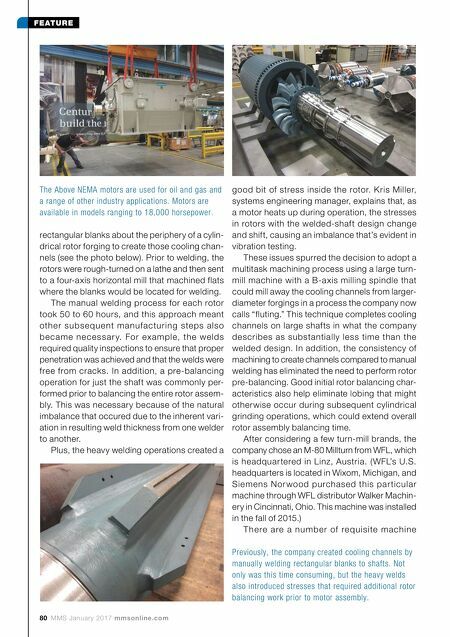 It was also helpful that WFL developed a part program for one rotor model that was machined during runoff test cuts performed in Linz to prove the process. Mr. Lassandro then worked closely with Siemens Norwood's engineering department so it under- stood the machine's capabilities and with the machine operators so they had a good feel for the new process, machining codes and cycles. T h at s a id, a l thou g h th e roto r m o d e ls a re similar, each often has slight design differences. Plus, rotors are machined in batches of one or t wo, not hu nd re d s, m e a ning n ew p ro g ra ms are developed quite frequently. Therefore, Mr. L a s s a n d ro h a s s t a r te d to b u i l d a l i b r a r y of programs for common rotor styles that he can call up, swap the 3D model for the new job, and then tweak to adjust for different flute depths, bearing diameters, keyway specifications and This M-80 Millturn from WFL is the multitasking machine Siemens Norwood chose to perform "fluting" operations to create the rotor cooling channels from a solid, cylindrical steel forging. The turn-mill machine features a 100-horsepower main spindle and 80-horsepower B-axis milling spindle. It can accommodate 20-inch-diameter shafts as long as 236 inches, which Siemens Norwood will take advantage of as it continues to design larger motors. Offline simulation is performed for each job to ensure there will be no interferences or collisions during the actual operations. A feature in the Crash Guard Studio software enables Mr. Lassandro to quickly remove workholding elements to get a clearer view of the cutting tool motion.